The driver of a Honda car is reported to have fled the scene after the vehicle ran off the road near Gablewoods Mall. The car jumped a gutter at the roadside, collided with three other vehicles in the Gablewoods Mall parking lot and slammed into a metal railing before coming to a halt, persons on the scene said. They told St Lucia Times that the Honda, bearing registration number PD 4367, was speeding towards Castries at the time of the incident about 4:00 Pm Sunday. The driver of one of the vehicles that was hit by the Honda told St Lucia Times that she was in the supermarket when she saw the Honda run off the road. “I guess he lost control – I am not sure. I just saw that he got off the road and some people ran and told me that my vehicle got mashed up. 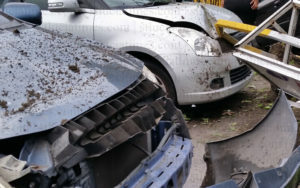 I noticed that my vehicle and another lady’s vehicle were damaged. I noticed the iron fell on the front of the car,” the driver recalled. “It’s amazing that you are inside of there shopping. You park thinking your vehicle is safe and that’s what happens,”she lamented. A third vehicle also sustained damage when the out of control Honda collided with it. No one is reported to have been injured in the incident. Warning….this parking lot is one of the most dangerous ones in St Lucia. I always tell people to avoid parking “underneath” an mal-designed curve on a substandard carriageway. Park closer to the supermarket instead or by MNC. I avoid parking there like the plague. The high speed around the corner, no barrier is a recipe for disaster. Surprised it hadn’t happened earlier. Thank God no-one was sitting in that lady’s car waiting for her. It is not every time someone flees that it is because of no documents. It could also be as a result of panic and shock. Sandra don’t make excuses for them criminals. They only run when they no they are doing illegal ****. There had to be docens of people there at that moment and they all let the guy run?